Orange’s Taylor Metzler (10) hammers home a kill during the first set of Thursday’s Division I regional semifinal against Dublin Coffman. The game was played at Worthington Kilbourne High School. 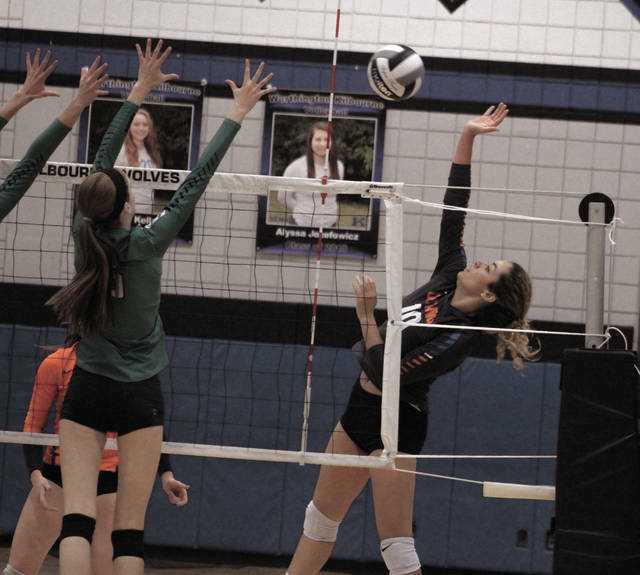 The Olentangy Orange volleyball team has shown a lot of growth over the past three seasons with league titles all three years and back-to-back district titles in the last two. And, despite a 25-15, 26-24, 25-11 loss to juggernaut Dublin Coffman in the Division I regional semifinal Thursday night at Worthington Kilbourne, Pioneer coach Katie Duy saw it as another step in the process of getting her team to the promised land. “I just want to keep taking steps forward and I think this year we did,” Duy said. “I think we played some tough competition and won some big matches in different situations and continued to gain confidence. She saw signs of how good her team can be in the second set when junior Taylor Metzler had five kills and an ace during an 8-2 run that gave the Pioneers (21-4) a 19-17 lead. Megan McCollum was a key on the back side. Trailing 23-21, the Shamrocks (24-2) closed 5-1 on a Riley Wagoner kill and a Jacy Sheldon block to take the set. Coffman’s been here before with 11 straight district titles and is one win away from a third consecutive state final four appearance. Duy took solace in making the Rocks sweat, particularly in that second set. Wagoner led with 20 kills, McKenzie Curry had eight and Sheldon added six for the Rocks, who won a matchup against Orange Aug. 29 in straight sets. Coffman plays St. Francis DeSales in the regional final Saturday at Kilbourne at 2 p.m. The Golden Eagles set the tone with a convincing first-set win and, after losing the second, won the third and fourth to secure a Division II regional semifinal win over Dover Thursday night in Zanesville. The Eagles looked poised to cruise into the regional final after winning the first set 25-12. Dover battled back, though, taking the second 26-24, but BW won the third and fourth by respective scores of 25-16 and 25-22 to seal the deal. Mac Podraza finished with a team-best nine kills to go with four aces, Kaley Rammelsberg finished with eight kills and Emma Urhammer had seven kills in the win. Next up, Big Walnut will take on Granville — a 3-0 winner over New Philadelphia — in Saturday’s regional final back at Zanesville.